18__. $5. PCGS. Ch New-63. PPQ. NJ. 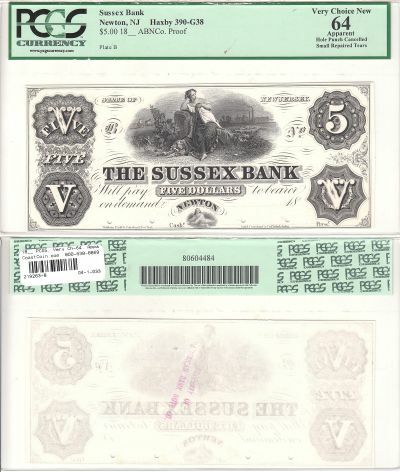 PROOF, Newton, The Sussex Bank. Has the typical hole punch cancellations. 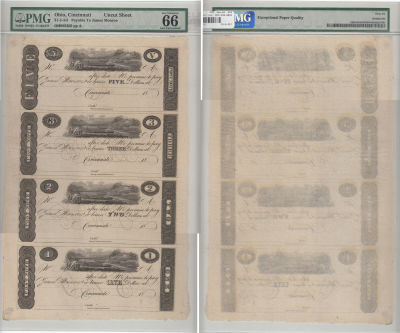 Pedigree to the American Bank Note archives. 18__. $5. PCGS. Very Ch-64. Apparent. NJ. 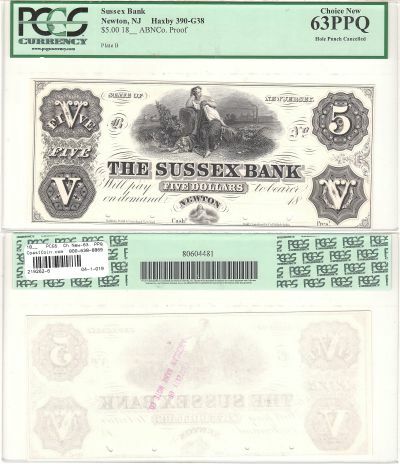 PROOF, Newton, The Sussex Bank. Has the typical hole punch cancellations. 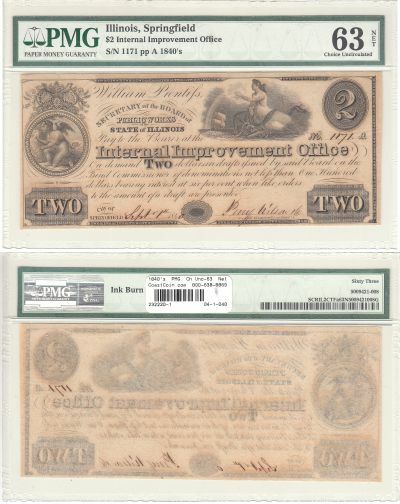 PCGS uses the apparent term for small repaired tears. 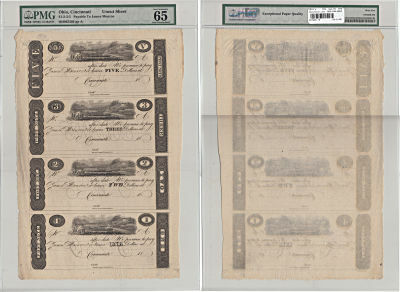 Pedigree to the American Bank Note archives. 1810's. $5,$3,$2,$1. PMG. Gem-65. EPQ. OH. Cincinnati Post Notes. 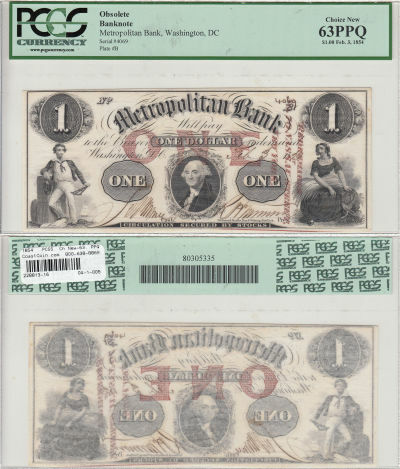 Uncut sheet of 4 notes. $1, $2, $3, $5 notes. 1810's. $5,$3,$2,$1. PMG. Gem-66. EPQ. OH. 1830's. $1,$2,$3,$5. PCGS. Very Ch-64. MI. 1840's. 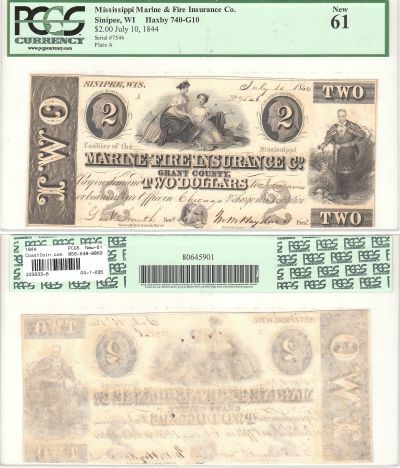 $2. PMG. Ch Unc-63. Net. IL. Springfield, Board Of Public Works, Internal Improvement Office. 1844. $2. PCGS. New-61. WI. 1850's. $5. PCGS. New-62. PPQ. NY. 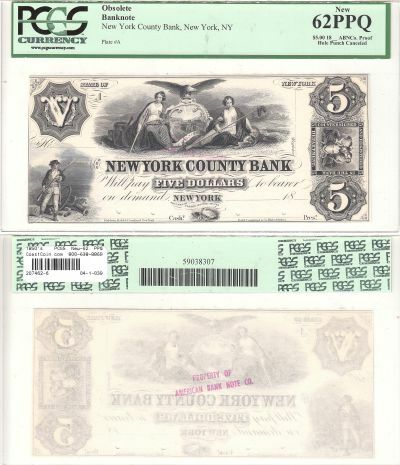 New York County Bank. PROOF. Vignette of maids with shield. 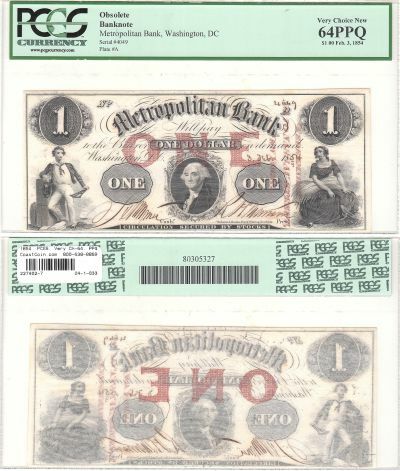 From the American Bank Note Co. archives. 1854. $1. PCGS. Ch New-63. PPQ. DC. Choose from 6 different notes! 1854. $1. PCGS. Very Ch-64. PPQ. DC. Metropolitan Bank Washington DC. 3 vignettes. Red ink reads "REDEEMABLE AT NO. 70 NASSAU STREET . NEW YORK". Red ONE in background. 1860's. $10. PCGS. Gem-65. PPQ. LA. 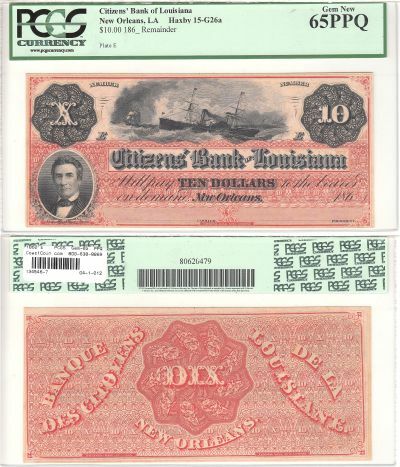 Citizens Bank of Louisiana, Vignette of USS Adriatic at Sea., The famous "Dix" note. 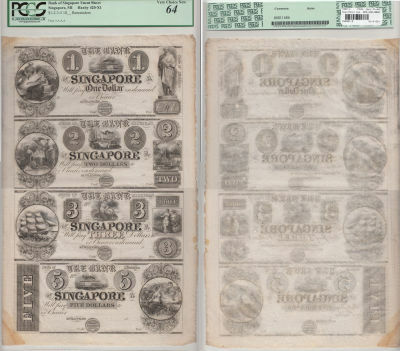 Considered by many to be the most beautiful obsolete currency issue of all. Simply a fantastic remainder note. 1865. $1. PCGS. Gem-66. PPQ. 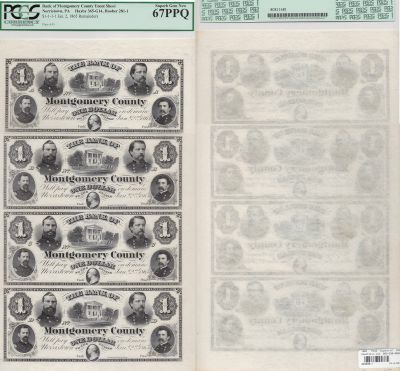 PA.
$1 4 note uncut sheet, Bank of Montgomery County, Norristown, Pennsylvania. 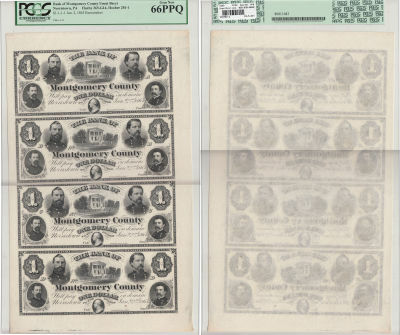 A truly scarce and magnificent sheet that could be the centerpiece of your collection. A great Civil War era vignette featuring the County Courthouse center surrounded by 3 Yankee Generals and a Colonel with the bust of George Washington bottom center. 1865. $1. PCGS. Superb-67. PPQ. PA.